The Super Bowl is on its way, and chicken wings are always a crowd-pleasing appetizer. This smoked chicken wing recipe using the Caliber Pro Kamado will keep your guests begging for more. Wash your wings, then add your favorite dry rub or soak in a marinade, preferably at least one day before. Prepare the Caliber Pro Kamado Smoker by filling the blaze basket accessory with lump charcoal. The basket should sit on the charcoal plate at the rear of the smoker with the hinged part of the grate above it for easy access. Bring the temperature of the smoker up to 250ºF. Once the temperature has settled, place your chicken wings directly on the grate. If you have the step up grill rack, this can almost double your cooking space. Now add a small handful of apple and pecan smoking chips to the blaze basket and close the lid. The smoker will “smoke” for the first 20-45 minutes of the 1½ -2 hour cooking process. After this time, there should be “clean” heat exiting the top vent. Too much time with “smoke” may impart a bitter taste into your wings. 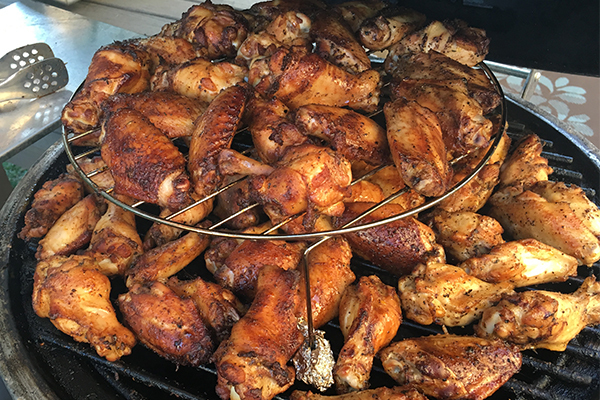 The meat is cooked when a thermometer probed into the wing reaches 165ºF. Enjoy the amazing juicy smoky flavor you get from the Caliber Pro Kamado, guaranteed to make your wings stand out from the rest on Super Bowl Sunday.